Reddit voting consists of up voting and down voting. These votes decide rank of the post, which ultimately decides the position of the story link. 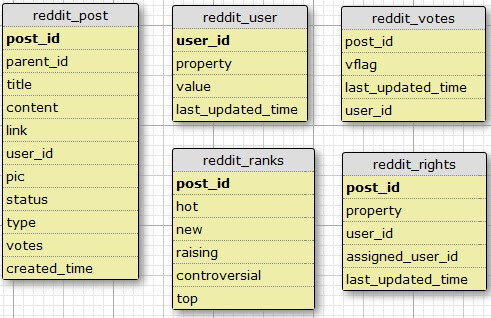 Here in this article, we are going to see simple architecture and database structure to implement reddit voting system. 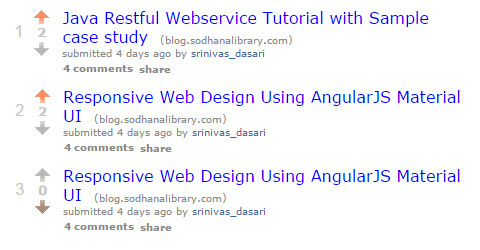 select * from reddit_votes where POST_ID = ? and USER_ID = ? update reddit_votes set VFLAG=?,LAST_UPDATED_TIME=CURRENT_TIMESTAMP where POST_ID=? and USER_ID=? delete from reddit_votes where POST_ID = ? and USER_ID = ? update reddit_post set VOTES = (select sum(vflag) from reddit_votes where POST_ID = ?) where POST_ID = ? Find below for jQuery code, It will handle up voting and down voting.